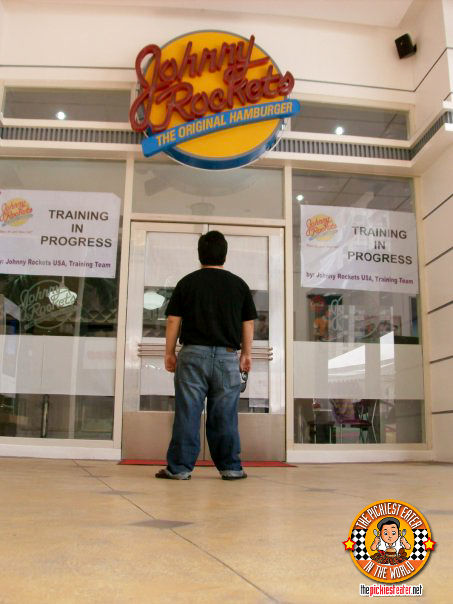 Rina and I were walking down along the new building of Eastwood when we came across the "Coming Soon" sign with the Johnny Rockets logo on it. as expected, I totally lost my freaking mind. 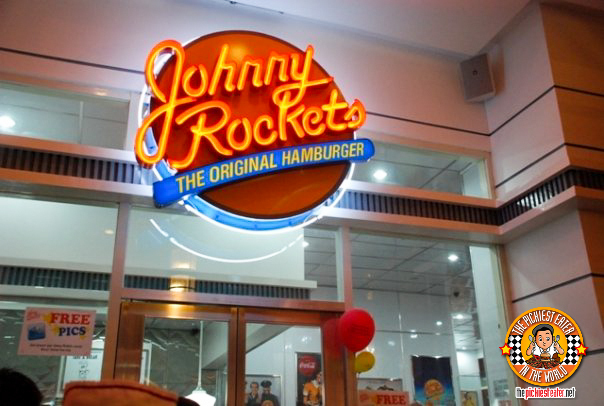 I had been to Johnny Rockets 12 years earlier, in the summer of 97' when my Ninang Pochay took me, my dad and bro to the branch in Beverly Hills. 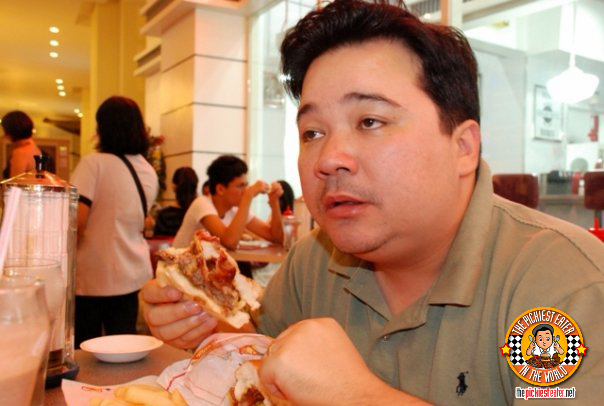 When you consider that it was 1997, and the only burgers the country only really knew back then were the Champ and the Big Mac, feasting on a burger as huge as the Double Smoke House was a life changing moment for me. 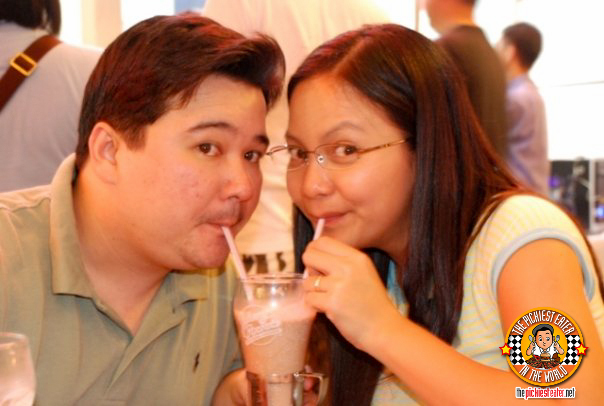 And their shakes were awesome.. It was the first time for me to be given the extra shake in the silver canister, so yeah it was a big deal. 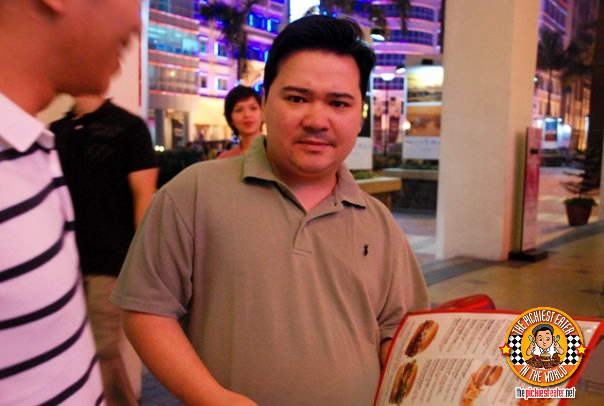 After pestering my cousin-in-law who lived in Eastwood at the time with "Are they opened yet?" texts every two weeks, the day finally came and they opened. Ironically, they opened on the day Ondoy struck, and no joke, I dead set on braving the storm ("It's just a little rain", I tried to convince Rina) for one of their Burgers. Finally, the date was set, and we were on our way to try one of the best burgers i had ever had. Would it live up to the memory that i had cherished for so long? First, as expected, the service wasn't all that great. That comes to no surprise, especially when you consider the place had just opened. They said we were 8th in line for a seat, but i had noticed that the outdoor area was virtually empty. After 15 minutes of waiting, Rina asked the waitress if we could just sit in the empty seats of the outdoor area, and the waitress said "Sure!". Umm... why didn't they offer it to us in the first place? 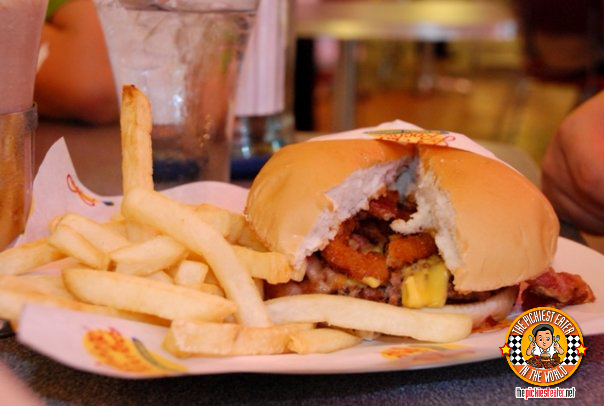 Second, The burgers were still pretty awesome, but nothing you couldn't really find from a place like Brothers Burger, Hot Shots or Bite Club - at a much cheaper cost. I was so excited that I forgot to list the prices down, but i assure you, with what I spent, i Could've gotten a decent steak dinner somewhere. 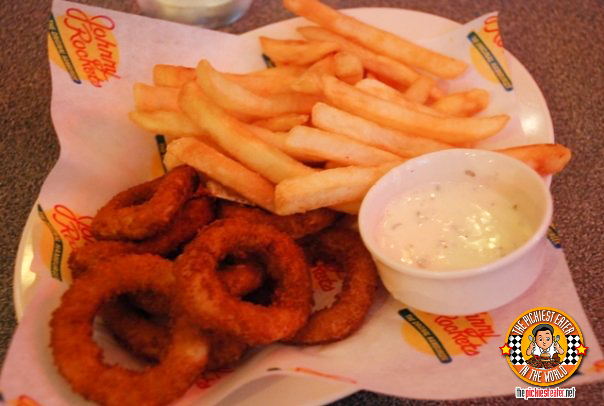 The Half and Half featured an order of Onion Rings and fries, with a side of Tartar sauce. Both, to be honest, were mediocre. It was good, but nothing really much to crow about. I found the Chocolate Milkshake to be rich and creamy, but it was a little bit too thick. 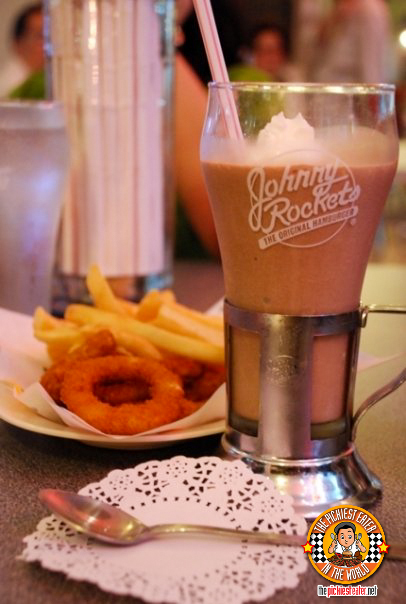 Maybe it would've been enjoyed better with a Zagu type straw.. hehe.. And in Johnny Rockets tradition, they gave it with the excess shake in the silver canister, but it was actually barely half of the glass.. a far cry from the portioning of their counterpart in the states. My Single Smoke House Burger, split down the middle. Just the way I like it. First bite. I think this was the part where i creamed my shorts. The Smoke House Burger (P500 plus) had everything I was looking for in a burger - Onion Rings, Bacon, and BBQ sauce. It was almost as if it was genetically engineered just for me! My only comment was the bun. It wasn't anything spectacular. Just like a standard issue, Gardenia bun. Still, it was a damn good burger. But was it really worth more than P500 bucks? I only got the single because.. umm.. i was on a diet.. AND the price was astronomical. 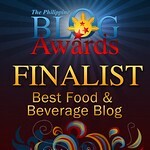 "The bacon is waving at me. ", Rina said. "The food is sticking it's tongue out at me cuz i'm a sucker for buying a 500 Peso Burger. ", I thought to myself. 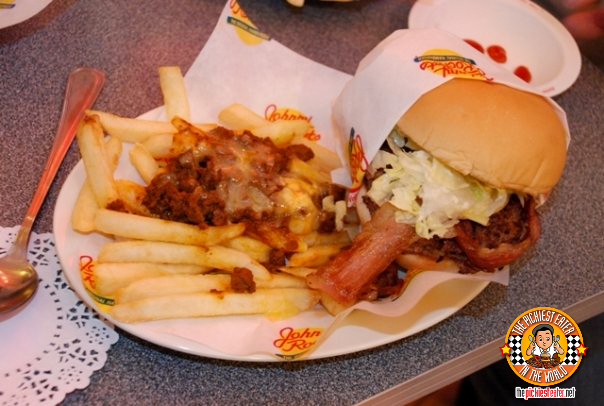 Rina seemed quite happy with her St. Louis Burger (P450-ish), and her side order of chili fries. (It gave me acids) It was quite big, so she wasn't able to finish it. The waitress asked if she wanted it wrapped, and she declined. Naturally, I swooped in and said yes. I then looked at Rina and said, "At that price, even if there was one bite left, I'd still take it home." 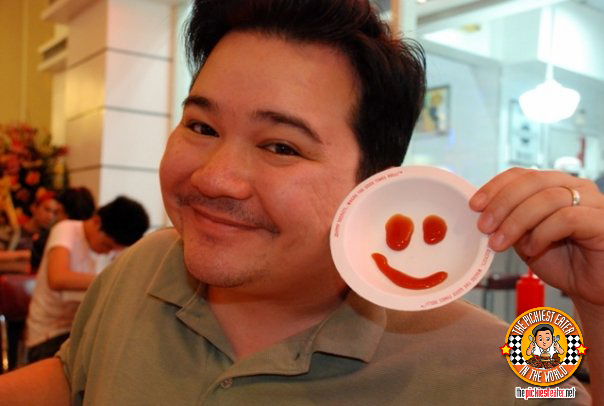 The waitress gave us Ketchup Smileys.. I thought she was hitting on me until i saw she gave everyone else one too.. 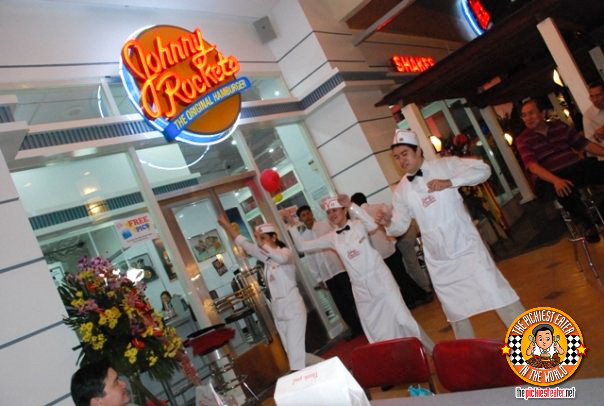 Honestly, Dinner in Johnny Rockets was an enjoyable experience, especially when the crew suddenly broke out into dance. Apparently, if you play certain songs from the jukeboxes on the tables inside, the crew boogies down to it. (Too bad we didn't have a table with a jukebox on it. i would've had my coins ready. hehe.. i'm a sadist, i know) I really love diner atmospheres so I knew I'd have a good time.